Nowadays organizational survival has become a toughest task, only through changing procedures, systems, structure and technology, one can’t guarantee organizational survival, and organizations also have to change the minds of their managers and employees . It is doubtless to say that the survival and growth of every organization depends upon its human resource and employees, these employees turn strategies of organization into reality . There are certain outcome of participative leadership which include improved decision making, job performance and less turn over . Resistance to change will be minimized and effectiveness will be enhanced due to participative leadership style, as in this style every employee is involved in decision making and employee’s suggestions and ideas are valued . The participative leadership-job performance relationship is not consistent and empirical studies have not yet established definite conclusion about this correlations . From employee perspective it enhances employee motivation, satisfaction, employee sense of power, job performance in different nations  and it also improves leader effectiveness in different cultures . The participative leadership is not studied till today as an antecedent of employee voice behavior. The reason behind participative leadership style as an antecedent of employee voice is as this type of leadership style “facilitate conversation, encouraging employee to share their ideas, one of the most effective leadership style, workers feel that their opinion counts”. Encouragement, facilitation, and feeling of employees that what they say is valued will make the participative leadership as an antecedent of employee voice because employee voice needs internal motivation which will be incorporated through these characteristics of participative leadership . Through provision of encouragement, support, and influence, this type of leadership aids his lower staff in joint activities and organizational decision-making process. Participative leadership prefers consultation over direction and endeavor to build consensus among team members . Organizational behavior scholar defined voice as it is an extra-role behavior i.e. discretionary, no formal reward is attached with voicing behavior and it challenges status quo . Employee voice was first introduced by Hirschman in 1970 in his seminal book. Employee voice is defined by a study “discretionary communication of ideas, suggestions, concern, or opinions about work related issues with the intent to improving organizational or unit functioning” . Massive studies have also proved that voice stave off crisis  enhancement in organizational process, innovation and organizational performance . Employee voice has positive impact on organizational effectiveness. Organizational effectiveness can be improved through when employees have new ideas and suggestions through raising their voice. Employee voice contributes to organizational effectiveness  and it is the leader which plays a huge role in shaping employee behavior . Two sides of voice with challenging status require further formal decision making on one side and on the other side it improves effectiveness of organization through improving individual innovative ability and co-ordination . Voice behavior needs motivation and this motivation is actually provides participative leadership. Participative leadership provides motivation to the employee as this motivation act as catalyst for employee to raise voice for suggestion, concern or dissatisfaction  and employee voice contribute to organizational effectiveness in terms of suggestion for change and improvement and this input by voice is more than that of task performance and organization citizenship behavior. This is evident from the recent voice meta-analysis . Voice has positive effects on organizational effectiveness but this research is limited and few studies have explained this relationship . Researchers often argue that employee voice enhances organizational effectiveness but there is less research on outcome of employee voice at organizational level . Conscientious is a stable personality dimension  these are those individuals who are indeed careful, thorough, well-ordered, well disciplined, and able to grasp their desire in check, devoted to their objectives, are determined, reliable, truthful, hard-working and achievement-endeavoring [20-23]. It is both used as trait as well as resource  apropos the COR theory it is expressed as resource because these people are busy in obtaining valuable resources for accomplishment of their important goals . Past studies [26,27], have shown that employee with this trait shown most willingness to speak up with ideas for the betterment. Consequently, the study provide an opportunity for the leader to know employees who have high conscientiousness, they would ostensibly share better ideas with organization, the input would be used in company policies, departmental improvement and employees more satisfaction with the job . As per the findings of a recent study, it has positive outcome comprising longevity, academic achievement, job performance, marital stability and satisfaction and also enhances behaviors related to health . Apart from positive outcomes there are studies which show less positive outcome are associated with too high conscientious people. Such type of individuals connect in obsessive-compulsive behavior  experience greater negative affect  react more poorly to negative performance feedback  unfavorable response to negative life incidents  do their work poorly compared to their moderate colleague . According to Barnard  effectiveness is achievement of organizational objectives and pays attention to “goal accomplishment” and organizational survival. Barnard also added that organization is a collaborative system and he measured organizational effectiveness with internal balance, adapting to external conditions, action and skillful leadership. Etzioni  also has a similar view point as Barnard said that effectiveness is the accomplishment of its goals. They defined organizational effectiveness as with fulfillment of customer needs . Organizational effectiveness is a diverse concept and there is no clear definition of organizational effectiveness and it is widely considered that it is the efficiency through which an organization or establishment achieves its aims and objectives . On the bases of above discussion following hypotheses have been developed. H5: The indirect path (mediated path) is moderated by a fourth variable conscientiousness in such a way that the relationship will be greater in case of high conscientiousness. Keeping in view the ever growing and aggressive service sector of Pakistan, we have taken the private banks based in twin cities of Rawalpindi and Islamabad as the target population of current study. Whole data have been collected from same employees of the same banks at 3-different intervals after a time lag of one month each. Banks were selected randomly from these two cities and 330 questionnaires were distributed on first time (T1) out of which 231 fully filled responses were received back at a response rate of 70%. On the 2nd time (T2) we again circulated 231 questionnaires and got back 211. During the 3rd time (T3) we distributed 211 questionnaires and received back 200 questionnaire. Demographic variables used in this study are gender (male, female), age (in years), education (1=High school/Secondary school, 2=Bachelor’s degree, 3=Master’s degree, 4=Doctoral degree), experience (in years) controlled as it may influence other variables . The demographics characteristic shows that there were 161(70%) male and 69 (30%) female. In order to show their age bracket there were about 19% employee whose ages are in the limit ‘25 years or less’, 69% employees are between age group ‘26-35’, about 9% employees fall within the age group 36-45, and 3% employees age come in age group above 46 year old. Experience of the employee shows that there were 44% employees whose experience fall in 1-4 years, 33% employees have experience in between 5-9 years, 18% employees have between 10-14 years and 5% employees have more 15 years’ experience. Education of employees shows that 21% employees were ‘Bachelor’s Degree’ holder, and 79% employees with having ‘Master Degree’. Participative leadership: is assessed with six items taken from the “Empowering Leadership Questionnaire” by Arnold et al. was used by Huang et al. to assess the leader behavior (1 represents strongly disagree while 5 represents strongly agree). Following items are some of them. “My immediate supervisor encourages us to express ideas/suggestions”. And “my immediate supervisor uses our suggestions to make decisions that affect us”. Reliability Cronbach’s α=0.90. Employee voice: has been measured with Six-item scale borrowed from Van Dyne et al. and used by Hsiung . ‘1’ is used for ‘strongly disagree’ and ‘5’ for ‘strongly agree’. Coefficient α for this scale was 0.92. Example items “I develop and make recommendations concerning issues that affect this work group”. “I speak up and encourage others in this group to get involved in issues that affect the group”. “I see myself as someone who…. • Can be somewhat careless (Reversed code)”. “Over the past two years, my organization has improved its ability to…..
“Coordinate the development efforts of different units”. Statistical analysis has been performed on SPSS (23-version) and AMOS (23- version). Before Hypothesis testing, Bivariate correlation and confirmatory factory analysis (CFA) is conducted. There is sufficient correlation among all variables. CFA, being measurement component of structured equation modeling (SEM) shows all latent variables have acceptable discriminant validity. All model fit like chi-square test, SRMR, RMSEA, TLI, and CFI are used for structure models. All have acceptable value. Moderation and mediation is done through preacher and Hays instructions and PROCESS Macro is used. For moderated mediation model 7 first stage is used. In order to know the relationship among various variables a Pearson correlation analysis is conducted on SPSS. A correlation articulates the power of association or co-occurs with between to variables and its value lies between -1 and +1. The correlation coefficient represented by the letter “r” its value is given in bold letter in the above Table 1 which shows some kind of the relationship between the variables. All the relationship we had developed in the form of hypothesis is correctly developed. Table 1: Descriptive statistics and correlation. The direct and positive correlation between participative leadership and organizational effectiveness is (0.674, p<.01), the correlation between participative leadership and employee voice is (0.760 and p<.01), positive correlation exists between employee voice and organizational effectiveness (0.735 and p<.01). Prior to hypothesis testing, we first carried out confirmatory factor analysis to make sure that the 4-latent variable (Participative leadership, Conscientiousness, Employee voice, and Organizational effectiveness) has acceptable discriminant validity. CFA which is the measurement component of Structure Equation Modeling consists of chosen variables of this study together with their respective scale items and latent construct. The said four-factor-model is Participative leadership with 5- item, Conscientiousness with 5-item, Employee Voice with 6-item, Organizational Effectiveness with 4-item. The composite reliability which is in between 0.79 and 0.83 for each construct is good and it exceeding the acceptable value of 0.60, so we acknowledge that all constructs are internally reliable and backing the suggestions of Bagozzi et al. and Fornell et al. [44,45]. With reference to Fornell et al. recommendations, composite reliability would be better when it is greater than 0.5. Conversely all the factors loading were significant of measurement model (α<.001) contributing to convergent validity . Average variance extracted (AVE) illustrates the proportion of variance construed by the latent factor from measurement error. It would be better construed by the latent variables and smaller the relative measure error is if the AVE is greater . According to Hair et al. recommendations, more than 0.5 value of AVE shows that the construct has high reliability. The AVE value for our study is greater than 0.50 except for Organizational effectiveness which is 0.37 (Table 2). Table 2: Confirmatory factor analysis. Subsequent to the measurement model, now we were conducting tests for structural models using SEM. Age, Gender, Qualification and Experience were keep constant due to their association with main variables of the study. Results of various fit statistics were reported like Chi-squared statistics (χ2), standardized mean square residual (SRMR), the Tucker-Lewis index (TLI) , “Comparative fit index” (CFI) , the “root mean-square error of approximation” (RMSEA) [51,52], and “Akaike information criterion” (AIC) . Acceptable value for the CFI and TLI is 0.90 or more depicts a good model fit while that for “RMSEA” should be ≤0.06 shows a good model fit . Hypothesis 1 (H1) states that Participative leadership has significant and positive relationship with employee voice (0.67). This hypothesis is accepted with CFI value (0.958) and TLI value (0.942). Whereas RMSEA value (0.051) and SRMR value (0.046) are within the recommended range. In the end it shows that the said model is fitted well with the data (Table 3). Table 3: Structured equation modeling. Hypothesis 2 (H2) states that Participative leadership (PL) has positive association with organizational effectiveness (OE). The said hypothesis depicts the direct relationship of independent variable, Participative leadership with dependent variable, Organizational effectiveness. PL has significant relationship with OE by (0.34). Tests of fitness are given below in the Table 4 they include CFI, TLI, Chisquare etc. (Figure 1). Figure 1: Participative leadership, Employee voice, and Organizational effectiveness. Table 4: Tests of fitness. From the table we conclude that more participative style of the leadership will enhance organizational effectiveness. Hypothesis 3 (H3) is about the relationship between employee voice and organizational effectiveness is (0.73). Sharing concerns, suggestions, ideas and opinions by employee with organization surely contribute to the organization. This is evident from the Table 5 given below. Table 5: Relationship between employee voice and organizational effectiveness. To test the moderation Hypothesis, (H5) Conscientiousness is used as an interaction variable between the proposed relationships, it will be stronger in case of high conscientiousness. For this purpose we used SPSS-23 version PROCESS MACRO by Hayes et al. . It is shown in the Table 6 below, the result confirms significant interaction effect of participative leadership and conscientiousness on employee voice. Table 6: Moderated Regression Analysis predicting employee voice. In the table the significance of interaction effect is p<0.05 and 95 % confidence interval (LLCI 0.004 and ULCI 0.0463) here zero (0) did not lie between the two upper and lower confidence interval hence we conclude that conscientiousness moderated the said relationship between participative leadership and employee voice. H:5 is supported from this assertion. For low score of the moderator i.e. conscientiousness the correlation between participative leadership and employee voice is insignificant. b=0.002, 95% CI [-0.083, 0.308], t (207)=1.135, p=0.26. For high score value of the moderator, conscientiousness, the said relation is significant. b=0.395, 95% CI [.023, 0.474], t (207)=2.785, p=0.045 (Figure 2). 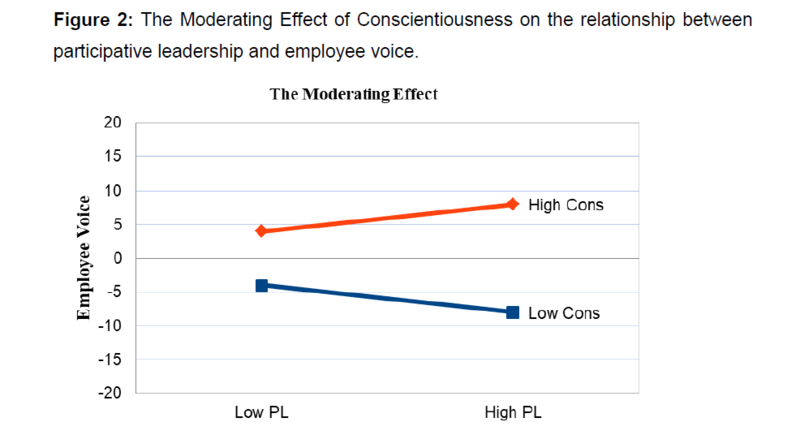 Figure 2: The Moderating Effect of Conscientiousness on the relationship between participative leadership and employee voice. The conception “Moderated mediation” first devised by James and Brett in 1984 . It occurs as the mediated path strength or weakness is contingent on the level of some other variables, put it another way when mediation is contingent on level of the moderator . Here in this Figure 3. “W” work as a moderator which affect the indirect path “a”. Figure 3: Moderated Mediated Analysis affecting indirect path. In our proposed model the indirect path is affected by a 4th variable known as Conscientiousness. In order to know this conditional indirect effect we used the PROCESS Macro by Hayes et al. .
As we already hypothesized that with high level of conscientiousness the indirect effect would be greater. For this we used PROCESS Macro and Model no7. If zero comes in between the two confidence intervals, it reveals that it does not strengthen the indirect path. If zero is not anywhere in these two intervals subsequently “moderated mediation” happening. The conditional indirect is significant for those employees who consider themselves high conscientious with 95% CI [LLCI: 0.0700, ULCI: 0.0155]. Here zero (0) does not lie between the lower and upper confidence interval. From Table 7 give below, the conditional indirect effect is not significant for those employees who have low score on conscientiousness with [LLCI: -0.0469 ULCI: 0.0068]. Zero (0) lies in between the lower and upper confidence interval, hence it’s not significant. From the above assertions, Index of moderated mediation (Table 7) and conditional indirect effect (Table 8) we conclude that hypothesis 5 (H5) is supported. High conscientiousness moderates the indirect relationship. Table 7: Index of moderated mediation. Table 8: Conditional indirect effect. Our first hypothesis stated that participative leadership is significantly and positively associated with employee voice. The result of our study shows that participative leadership is positively related to employee voice. Our second hypothesis is about the direct relationship of participative leadership with organizational effectiveness turned positive in our results which has been supported by previous studies too [6,58,59]. Previously, various studies have revealed that employee voice as suggestions, ideas and opinions about issues related to organizational enhanced effectiveness , and as per Parke et al. recent study stated that despite other effects of employee voice on organization, it “practically” contribute to the organizational effectiveness. In our study employee voice acts as mediator between participative leadership and organizational effectiveness and for these both of the direct and indirect effect is significant and supported by the results of our study, so the mediation hypothesis is also accepted. The straight path from participative leadership to organizational effectiveness is (0.34) and the indirect relation from participative leadership to employee voice is (0.67) and employee voice to organizational effectiveness is (0.73), so both the direct and indirect path are positive and significant hence partial mediation occurs. The results that participative leadership is correlated with employee voice also supported by other studies that participative climate and participative management theoretically links and encourages employees to speak up and their new ideas and suggestions are valued . When the indirect path ‘a’ is effected by a fourth variable is known as first stage of moderated mediation. Through index of moderated mediation and conditional indirect effect, we have concluded that both methods showed significant relationship. The significance of this path is known through lower and upper confidence interval. When zero (0) lies in between the lower and upper confidence interval then the indirect path is not moderated by a moderator and hence no moderated mediation takes place. Our result shows that zero (0) did not lay between the upper and lower confidence interval consequently the indirect path is moderated by a variable conscientiousness. This path is significant only for those employees who are high conscientious and insignificant for low conscientious. As a result the moderated hypothesis is accepted. Previous studies have shown that one of the Big Five Personality Traits, conscientiousness is related to employee voice [27,62,63]. The limitations of the study are regarding data which was collected through self-report measured model, but this limitation is partly done away with 3-different time’s data collection technique . The data was collected only from banking sector based in twin cities of Islamabad and Rawalpindi so the applicability of this study should be verified through a separate study in other institutions. Another limitation of the study was the small sample size collected from employees of the banks so the common method variance question may arise . Keeping in views the above limitations of the study and others, there are opportunities for future research directions. First the same model should be tested in other businesses and population and in other culture also for generalizability of the study. In our study the time gap for the data collection in the 3-time-lagged design is just one month which may not be better for causality. As there is no universally recommended lag, it usually starts from 1-moth to over years as quoted in these studies [66,67]. Some studies suggested shorter time lags of one month, 6-month and 6-week for better causality . Hence 3 month time lag would be good for future researcher for better causal effect. In this study we only discussed employee voice which effect organizational effectiveness and didn’t consider the associated behavior of employee silence as quoted in the study of Liu et al. which could be considered for any future research. Alipour M, Taleghani M (2016) The Relationship between Entrepreneurial Skills of Managers and Organizational Effectiveness in Small and Medium Enterprises-Case Study: Representatives of Iran Khodro in Mazandaran Province. Journal of Administrative Management, Education and Training, 12: 03-08. Constantin EC, Baias CC (2015) Employee Voice• Key Factor in Internal Communication. Procedia-Social and Behavioral Sciences 191: 975-978. Ghaffari S, Burgoyne J, Mad Shah I, Nazri M, Salah Aziz JS (2017) Investigating the mediation role of respect for employees on the relationship between participative leadership and job satisfaction: A case study at University Teknologi Malaysia. Australian Journal of Basic and Applied Science 11: 1-13. Pardo-del-Val M, Martinez-Fuentes C, Roig-Dobón S (2012) Participative management and its influence on organizational change. Management Decision 50: 1843-1860. Lam CK, Huang X, Chan SC (2015) The threshold effect of participative leadership and the role of leader information sharing. Academy of Management Journal 58: 836-855. Huang X, Iun J, Liu A, Gong Y (2010) Does participative leadership enhance work performance by inducing empowerment or trust? The differential effects on managerial and non‐managerial subordinates. Journal of Organizational Behavior 31: 122-143. Dorfman PW, Hanges PJ, Brodbeck FC (2004) Leadership and cultural variation: The identification of culturally endorsed leadership profiles. Culture, leadership, and organizations: The GLOBE study of, 62: 669-719. Newman A, Rose PS, Teo ST (2016) The role of participative leadership and trust‐based mechanisms in eliciting intern performance: Evidence from China. Human Resource Management 55: 53-67. Van Dyne L, LePine JA (1998) Helping and voice extra-role behaviors: Evidence of construct and predictive validity. Academy of Management Journal 41: 108-119. Morrison EW, Wheeler-Smith SL, Kamdar D (2011) Speaking up in groups: a cross-level study of group voice climate and voice. Journal of Applied Psychology 96: 183. Schwartz J, Wald ML (2003) The Nation: NASA’s curse?“ Groupthink” is 30 years old, and still going strong. New York Times 9: 5. Aryee S, Walumbwa FO, Mondejar R, Chu CW (2017) Core self-evaluations and employee voice behavior: Test of a dual-motivational pathway. Journal of Management 43: 946-966. Detert JR, Burris ER, Harrison DA, Martin SR (2013) Voice flows to and around leaders: Understanding when units are helped or hurt by employee voice. Administrative Science Quarterly 58: 624-668. Van Kleef GA (2009) How emotions regulate social life: The emotions as social information (EASI) model. Current Directions in Psychological Science 18: 184-188. Benoliel P, Somech A (2014) The health and performance effects of participative leadership: Exploring the moderating role of the Big Five personality dimensions. European Journal of Work and Organizational Psychology 23: 277-294. Chamberlin M, Newton DW, Lepine JA (2017) A meta‐analysis of voice and its promotive and prohibitive forms: Identification of key associations, distinctions, and future research directions. Personnel Psychology 70: 11-71. Hsiung HH (2012) Authentic leadership and employee voice behavior: A multi-level psychological process. Journal of Business Ethics 107: 349-361. George LG, Helson R, John OP (2011) The “CEO” of women's work lives: How Big Five Conscientiousness, Extraversion, and Openness predict 50 years of work experiences in a changing sociocultural context. Journal of Personality and Social Psychology 101: 812. Colbert AE, Barrick MR, Bradley BH (2014) Personality and leadership composition in top management teams: Implications for organizational effectiveness. Personnel Psychology 67: 351-387. Roberts BW, Chernyshenko OS, Stark S, Goldberg LR (2005) The structure of conscientiousness: An empirical investigation based on seven major personality questionnaires. Personnel Psychology 58: 103-139. Digman JM (1990) Personality structure: Emergence of the five-factor model. Annual Review of Psychology 41: 417-440. McCrae RR, John OP (1992) An introduction to the five‐factor model and its applications. Journal of Personality 60: 175-215. Russell E, Woods SA, Banks AP (2017) Examining conscientiousness as a key resource in resisting email interruptions: Implications for volatile resources and goal achievement. Journal of Occupational and Organizational Psychology 90: 407-435. Halbesleben JR, Neveu JP, Paustian-Underdahl SC, Westman M (2014) Getting to the “COR” understanding the role of resources in conservation of resources theory. Journal of Management 40: 1334-1364. Barrick MR, Mount MK (1991) The big five personality dimensions and job performance: a meta‐analysis. Personnel Psychology 44: 1-26. LePine JA, Van Dyne L (2001) Voice and cooperative behavior as contrasting forms of contextual performance: evidence of differential relationships with big five personality characteristics and cognitive ability. Journal of Applied Psychology 86: 326. Pine LS, Desa NM, Asaari MHAH (2016) Big Five Factors and Employees’ Voice Behavior among Employees in Small-Medium Enterprise in Penang. Review of European Studies 8: 22. Delgado MM, Sulloway FJ (2017) Attributes of conscientiousness throughout the animal kingdom: An empirical and evolutionary overview. Psychological Bulletin 143: 823. Roberts BW, Jackson JJ, Fayard JV, Edmonds G, Meints J (2009) Conscientiousness. Fayard JV, Roberts BW, Robins RW, Watson D (2012) Uncovering the affective core of conscientiousness: The role of self‐conscious emotions. Journal of Personality 80: 1-32. Cianci AM, Klein HJ, Seijts GH (2010) The effect of negative feedback on tension and subsequent performance: The main and interactive effects of goal content and conscientiousness. Journal of Applied Psychology 95: 618. Boyce CJ, Wood AM, Brown GD (2010) The dark side of conscientiousness: Conscientious people experience greater drops in life satisfaction following unemployment. Journal of Research in Personality 44: 535-539. Carter NT, Guan L, Maples JL, Williamson RL, Miller JD (2016) The downsides of extreme conscientiousness for psychological well‐being: The role of obsessive compulsive tendencies. Journal of Personality 84: 510-522. Barnard CI (1938) The Functions of the Executive. Harvard University Press, Cambridge 334. Etzioni A (1964) Modern organizations. Salancik, G. R., and Pfeffer, J. (1978). A social information processing approach to job attitudes and task design. Administrative science quarterly, 224-253. Chidambaranathan K, Swarooprani BS (2015) Knowledge management as a predictor of organizational effectiveness: the role of demographic and employment factors. The Journal of Academic Librarianship 41: 758-763. Van Der Vegt GS, Bunderson JS (2005) Learning and performance in multidisciplinary teams: The importance of collective team identification. Academy of management Journal 48: 532-547. Arnold JA, Arad S, Rhoades JA, Drasgow F (2000) The empowering leadership questionnaire: The construction and validation of a new scale for measuring leader behaviors. Journal of Organizational Behavior pp: 249-269. Fong EA, Tosi Jr HL (2007) Effort, performance, and conscientiousness: An agency theory perspective. Journal of Management 33: 161-179. Gold AH, Malhotra A, Segars AH (2001) Knowledge management: An organizational capabilities perspective. Journal of management information systems 18: 185-214. Abd Rahman A, Imm Ng S, Sambasivan M, Wong F (2013) Training and organizational effectiveness: moderating role of knowledge management process. European Journal of Training and Development 37: 472-488. Bagozzi RP, Yi Y (1989) The degree of intention formation as a moderator of the attitude-behavior relationship. Social psychology quarterly pp: 266-279. Fornell C, Larcker DF (1981) Evaluating structural equation models with unobservable variables and measurement error. Journal of marketing research pp: 39-50. Anderson JC, Gerbing DW (1988) Structural equation modeling in practice: A review and recommended two-step approach. Psychological bulletin 103: 411. Shyu CS, Li YL, Tang Y (2013) Applying Confirmatory Factor Analysis on the Measure for Restaurant Over-service. The Journal of International Management Studies 8: 10-16. Hair JF, Black WC, Babin BJ, Anderson RE, Tatham RL (2006) Multivariate data analysis. Uppersaddle River: Pearson Prentice Hall. Bentler PM, Bonett DG (1980) Significance tests and goodness of fit in the analysis of covariance structures. Psychological Bulletin 88: 588. Browne MW, Cudeck R (1993) Alternative ways of assessing model fit. Sage154: 136-136. Steiger JH (1990) Structural model evaluation and modification: An interval estimation approach. Multivariate Behavioral Research 25: 173-180. Byrne BM (2001) Structural equation modeling: Perspectives on the present and the future. International Journal of Testing 1: 327-334. Hayes AF, Scharkow M (2013) The relative trustworthiness of inferential tests of the indirect effect in statistical mediation analysis: Does method really matter. Psychological Science 24: 1918-1927. James, L. R., & Brett, J. M. (1984). Mediators, moderators, and tests for mediation. Journal of Applied Psychology, 69(2), 307. Preacher KJ, Rucker DD, Hayes AF (2007) Addressing moderated mediation hypotheses: Theory, methods, and prescriptions. Multivariate Behavioral Research 42: 185-227. Miao Q, Newman A, Schwarz G, Xu L (2013) Participative leadership and the organizational commitment of civil servants in China: the mediating effects of trust in supervisor. British Journal of Management p: 24. Huang X, Shi K, Zhang Z, Cheung YL (2006) The impact of participative leadership behavior on psychological empowerment and organizational commitment in Chinese state-owned enterprises: the moderating role of organizational tenure. Asia Pacific Journal of Management 23: 345-367. Parke MR, Seo MG (2017) The role of affect climate in organizational effectiveness. Academy of Management Review 42: 334-360. Lee GL, Diefendorff JM, Kim TY, Bian L (2014) Personality and participative climate: Antecedents of distinct voice behaviors. Human Performance 27: 25-43. Nikolaou I, Vakola M, Bourantas D (2008) Who speaks up at work. Dispositional influences on employees' voice behavior. Personnel Review 37: 666-679. Chiaburu DS, Oh IS, Berry CM, Li N, Gardner RG (2011) The five-factor model of personality traits and organizational citizenship behaviors: A meta-analysis. Journal of Applied Psychology 96: 1140. Bednall TC, Sanders K, Runhaar P (2014) Stimulating informal learning activities through perceptions of performance appraisal quality and human resource management system strength: A two-wave study. Academy of Management Learning and Education 13: 45-61. Podsakoff NP (2003) Common method biases in behavioral research: A critical review of the literature and recommended remedies. Journal of Applied Psychology 88: 879-903. Khan TI, Akbar A, Jam FA, Saeed MM (2016) A Time-Lagged Study of the Relationship Between Big Five Personality and Ethical Ideology. Ethics and Behavior 26: 488-506. Hakanen JJ, Peeters MC, Schaufeli WB (2018) Different types of employee well-being across time and their relationships with job crafting. Journal of Occupational Health Psychology 23: 289. Demerouti E, Bakker AB, Bulters AJ (2004) The loss spiral of work pressure, work–home interference and exhaustion: Reciprocal relations in a three-wave study. Journal of Vocational Behavior 64: 131-149. Liu W, Song Z, Li X, Liao Z (2017) Why and when leaders’ affective states influence employee upward voice. Academy of Management Journal 60: 238-263.